Since the Democratic Progressive Party (DPP), led by Tsai Ing-wen, won Taiwan’s presidential and legislative elections in January 2016, China has taken a series of steps to isolate the self-governing island from the international community. These steps have included prevailing upon four countries – Panama, Sao Tome and Principe, Burkina Faso, and the Dominican Republic – to sever their long-term diplomatic relationships with Taiwan, as well as depriving Taiwan of its observer status at the World Health Assembly. In the most recent such incident, China successfully pressured 44 airlines from around the world, including four based in the United States, to remove “Taiwan” as keyword from their booking systems. At the same time, China moved to deprive Taichung City in central Taiwan of its host-city status for the upcoming 2019 East Asian Youth Games, which it had been awarded in 2012. Why is China continuing to bully Taiwan? Many analyses fail to look beyond the communist mainland’s reflexive dislike for democratic Taiwan’s new pro-independence regime. If that is indeed China’s motivation, these moves are counterproductive. China’s intimidation against the DPP regime will only serve to make China and the Kuomintang (the KMT), with its anti-independence stance, even less popular among the Taiwanese people. Indeed, in the wake of the aforementioned incidents involving international airlines and the East Asian Youth Games, some Taiwanese media and commentators have been making more sanguine predictions about the DPP’s likely performance in the November 2018 local elections. In other words, China’s intimidation of Taiwan may indeed only add to the electoral woes of the ever-weakening KMT. Nevertheless, China’s recent coercive actions must be recognized as elements of a precisely calibrated strategy on the part of Chinese cross-strait policymakers. The logic of this strategy is not to win over the hearts of the Taiwanese population, but rather to weaken the authority of the government of Taiwan, due to the latter’s strong opposition to the “one China” principle. A similar strategy was also pursued by Beijing during Taiwan’s first DPP government, led by President Chen Shui-bian from 2000 to 2008. In the early years of Chen’s administration, he had hoped that taking a non-provocative stance would enable him to commence a dialogue with Beijing. However, Beijing not only refused to talk to Chen’s regime at all, but also strengthened its efforts to suppress Taiwan in the diplomatic sphere. It was only in the wake of the ensuing setbacks on the world stage, and a series of corruption scandals linked to his family, that Chen embraced pro-independence hardliners and their radical ideological agenda. However, this conversion not only led the DPP to be comprehensively defeated at the ballot box, but also caused considerable friction between the party and the Bush administration in the United States. In hindsight, the DPP regime’s rapid loss of the trust and support of Taiwan’s most important ally was one of the most successful examples of China’s “wedge strategy” approach to Taiwan in the first decade of 21st century. A similar strategy can also been discerned in China’s handling of Hong Kong. In the post-Umbrella Movement era, Beijing has strategically repressed and sidelined Hong Kong’s pro-independence groups, one of the minority factions in Hong Kong’s pro-democracy camp; the net effect has been to increase the public profile of radical pro-independence groups. While this has done nothing directly to improve China-Hong Kong relations, it has effectively undermined the moderate faction of the pro-democracy camp, insofar as most supporters of democracy have proved reluctant to sustain their support for the movement since it came to be seen as radicalized. Tsai’s clear understanding of the need to retain the trust of the United States and the support of a majority of Taiwan’s voters means that she has had to distance herself from policies rooted in the radical ideology of Taiwan independence. Specifically, she has vowed to maintain the status quo since her inauguration, and has never made the first move in any sensitive situation involving conflict or potential conflict with the mainland. Yet, even when dealing with a pragmatic DPP leader who has declared that she will not return to the past politics of confrontationism, China has continued – and indeed, reinvigorated – its efforts to create an atmosphere of isolation and despair across Taiwanese society, as a means of triggering a loss of public confidence in the DPP administration, and forcing Tsai to completely change her position on independence. Yet, because these bullying actions could equally have the effect of strengthening the legitimacy of and support for the hardline pro-independence position, they place Tsai in a serious policy dilemma. On the one hand, if Tsai doesn’t radicalize her current political stance, then her pro-independence political allies and rank-and-file supporters may drift away to minor parties that hold more extreme pro-independence positions. One of these, the New Power Party, already the third largest party in Taiwan’s parliament, is targeting the growing electoral space made available by the DPP’s retreat from prominent endorsement of the independence ideology. 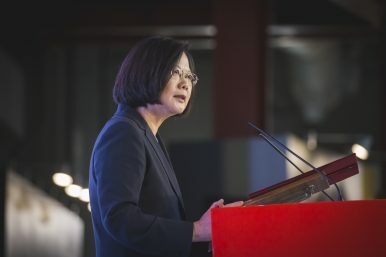 On the other, if Tsai does embrace a radical independence philosophy, her administration will risk losing the support not only of the United States, as Chen did, but also of the majority of Taiwanese citizens, whose main priorities are the maintenance of stable cross-strait relations and continuing economic development. Therefore, far from being fixated on its image in Taiwan, or the fate of the KMT, China is working to undermine the confidence of the Taiwanese people in the DPP regime, and to force an abrupt end to Tsai’s delicate policy balancing act. Thus, even through they are in one sense pursuing a “lose-lose” strategy, China’s powerful suppression measures are only likely to grow stronger as time passes. Tsai can do very little. She must unite the people of Taiwan as much as possible against these external threats, and strengthen their faith in defending Taiwan’s democracy, yet those Taiwanese citizens who are most angered or frustrated by China’s coercive actions are most likely to desert her at the ballot box. Support from the international community – and especially the United States, Japan, and other democratic countries – will therefore be crucial to the question of whether Tsai’s government can maintain stable cross-strait relations. Any form of support could strengthen the domestic legitimacy of Tsai’s current international stance, while at the same time constraining China’s ongoing attempts to destabilize the cross-strait status quo. Chih-Cheng Chang, Ph.D., is a visiting scholar at the Fairbank Center for Chinese Studies at Harvard University. He is also a policy columnist for Thinking Taiwan, which was established by the Thinking Taiwan Foundation created by Taiwanese President Tsai ing-wen.